The Environment Association is a community based organisation, run entirely by volunteers. TEA provides information and assistance to the community, and campaigns for nature conservation. 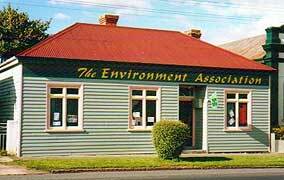 TEA operates an environment centre and holds activities at Environment House in Deloraine. If you have a problem or a query about an environment issue we may be able to assist. As it receives no government funding, TEA relies on its members and supporters for its financial well-being. Of course this means there are few resources for power, rates, insurance, and other recurrent expenses. Donations are gratefully received. If you wish to make a donation, please send us a cheque. There is plenty of scope for members to participate and new members and volunteers are always welcome. If you want to join, help us, or know more about TEA then please feel free to contact us. The Environment Association welcomes new members and volunteers.